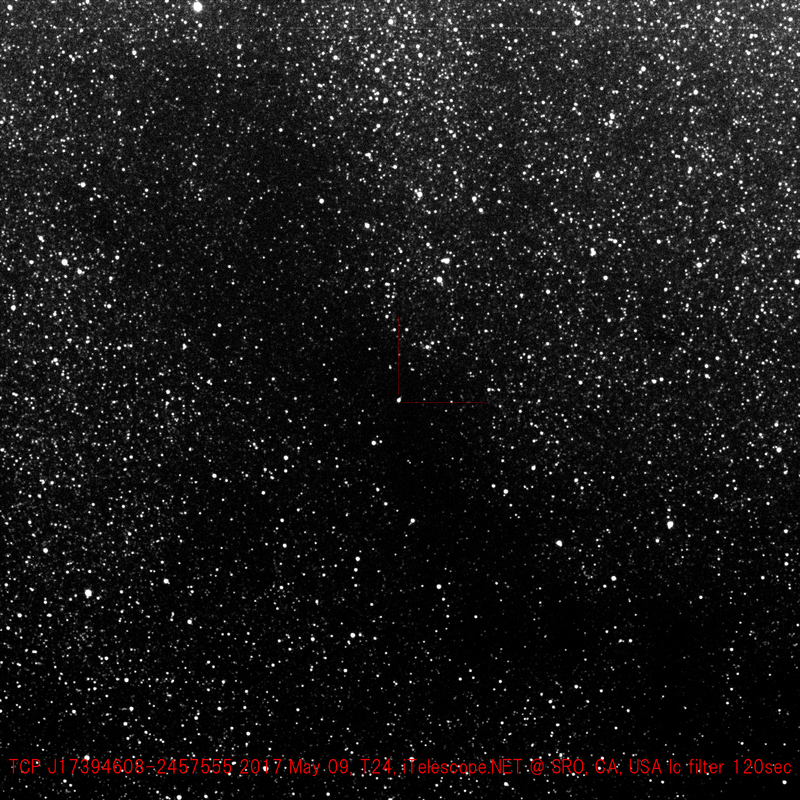 Spectra: Spectroscopy indicating that TCP J17394608-2457555 is an FeII nova (highly reddened) was obtained 2017 May 11.15 UT by S. C. Wiliams (Lancaster) and M. J. Darnley (LJMU) (ATel #10366). Charts: Charts with a comparison star sequence for TCP J17394608-2457555 may be created using the AAVSO Variable Star Plotter (VSP). Submit observations: Please submit observations to the AAVSO International Database using the name TCP J17394608-2457555. Once a GCVS name is announced in an IAU Circular or CBET, please use that name. a. Designated TCP J17394608-2457555 when posted to the IAU Central Bureau for Astronomical Telegrams Transient Object Confirmation Page (TOCP). Unless otherwise noted, the information in this Alert Notice is taken from the TOCP page or ATels #10366 and #10367.
b. 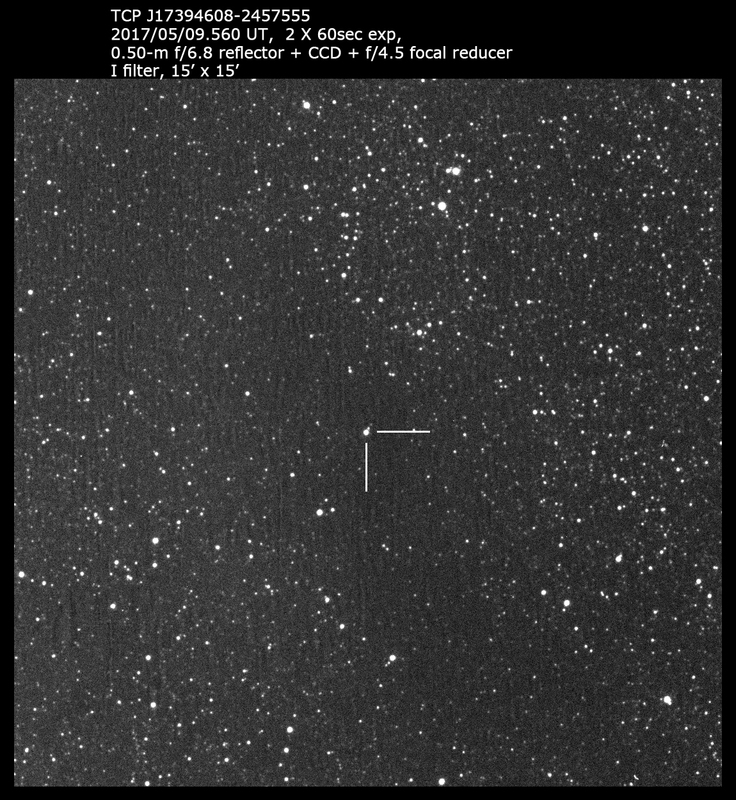 Confirmed by Itagaki with 0.50-m reflector + CCD after discovery. c. K. Yoshimoto (Yamaguchi-ken, Japan, 2017 May 10.561 UT) reports position end figures 46.09s, 55.1". d. J. Strader et al. (ATel #10367) report ASAS-SN photometry of TCP J17394608-2457555 (see observation above): "The subsequent light curve shows substantial variability between V~14 and V~16. The epoch in which the nova is brightest is Apr 30.24 (V=14.1) but there is, as of yet, no well-defined peak in the light curve." 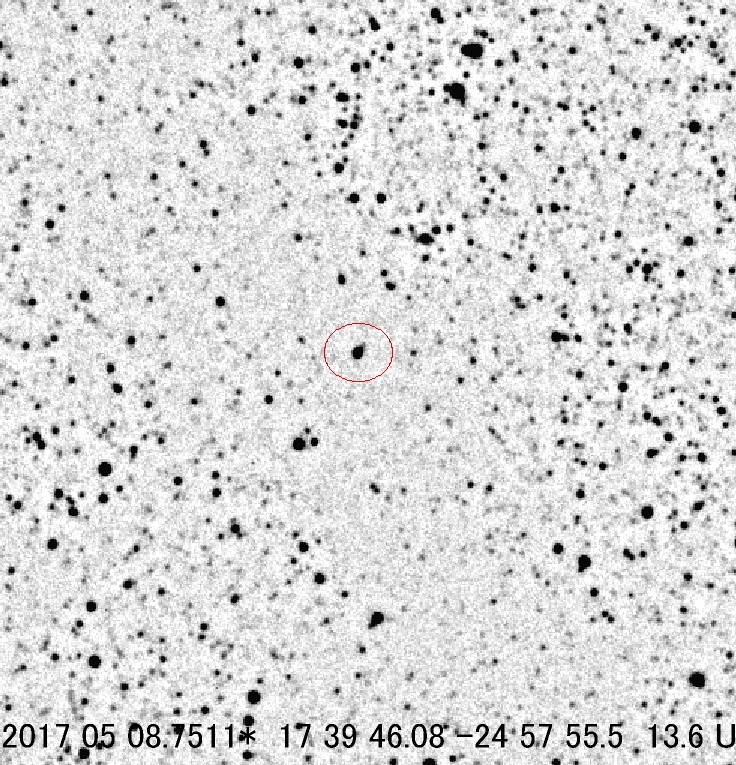 e. P. Schmeer (Saarbruecken-Bischmisheim, Germany) reports that "The red star (bright in the infrared) 2MASS J17394584-2457504 is located 6" from the reported position of the transient. Further designations for this red star are USNO-B1.0 0650-0519036 (R1= 17.26, B2= 19.52, R2= 18.15, I= 14.06 mag) and GSC2.3 S8E3029093 (F= 17.24 mag). At the transient's position itself nothing is visible in DSS images, and there is no VizieR match."